Manhattan Scientifics CEO Issues Letter To Shareholders | News | Manhattan Scientifics Inc. Thank you for your investment in Manhattan Scientifics. I want to personally and corporately thank all our shareholders for their encouragement. I sincerely believe that 2012 is going to be a break-out year for Manhattan Scientifics. This letter is my opportunity to summarize what has transpired in 2011 and to share with you some of our plans for the coming year. When I was first recruited to serve as CEO of Manhattan Scientifics and be a part of the restructuring process, I accepted with great enthusiasm and passion. The opportunity to create a significant new player in the global Nano-medicine market was much too important to refuse. Since that time, I believe we have succeeded in creating a corporate structure and team that have truly revitalized Manhattan Scientifics. Our business model of acquiring early to middle stage technologies gives us the ability to potentially earn a high financial rate of return with a very low financial risk. An example of the success of this model was first realized with our Nano-metals project and our acquisition of Metallicum Inc. with the subsequent sale of an exclusive and revenue generating license to Carpenter Technologies (CRS). Maintaining and increasing the value of the Carpenter license agreement. Expanding sales of Nano titanium dental implants through BASIC Dental to increase near term license revenue. Carpenter Technologies has invested substantial amounts of capital into both plant and equipment in preparations to commercialize our inventions. 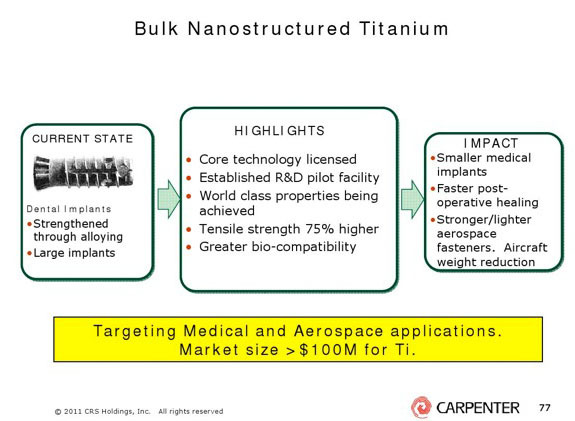 In a recent (Feb 2011) Investor presentation held in New York City, Carpenter made the following presentation and near term forecasts. In June 2011, we acquired Senior Scientifics and the entire portfolio work of Dr. Edward R. Flynn’s work in the detection and treatment of cancer technologies. The technology uses superparamagnetic nanoparticles and a sensitive magnetic instrument to find cancer early, to detect cancer cells from benign lesions, and to accurately monitor cancer growth and spread. It offers breakthrough new capabilities in human cancer detection and treatment, as well as in cancer research programs. Since that time we have been aggressively identifying potential licensing partners in both the Big Pharma and medical instrument manufacturing space. We are also continuing to mature the technology to further enhance its value. We have demonstrated use in breast cancer, prostate cancer, leukemia, ovarian cancer, and measurement of amyloid plaque in Alzheimer’s disease. We have also had successful meetings with leading cancer physicians/clinicians from both MD Anderson Cancer Center and Memorial Sloan Kettering Cancer Center (MSKCC). Collaborative pilot studies are being planned with both institutions, in addition to our continuing work with Univ. of New Mexico Health Sciences Center. As a significant shareholder in Manhattan Scientifics, I am very much aware of what has to be done to increase our shareholder value and I am looking forward to all of us sharing in the value that both of our Nano-medicine projects will create. I would also like to know many of you on a personal basis and thus I would urge you to contact me at mannyt@manhattan-scientifics.com. My team and I are available to answer any questions you may have and we are legally allowed to answer. Finally, I would like to thank our Manhattan Scientifics board of directors, advisors and consultants for their work and dedication to helping me build this “great little company” and I would also like to wish everyone a happy and prosperous holiday season. I am grateful for your belief in our company and your investment.